Zoo Atlanta features around 1,000 animals representing 250 species from around the world and sees over 1 million tourists every year. 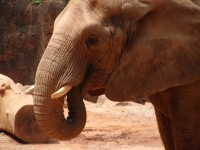 Founded in 1889, the zoo has become one of Atlanta's top family attractions. It houses exhibitions on the African rainforest, a free-flying parakeet enclosure, and a reptile house. Children will absolutely love discovering all the animals, including the rare the giant pandas, Sumatran tigers, clouded leopards, and komodo dragons. The zoo also has the country's largest collection of gorillas and orangutans. For smaller children there is a petting zoo where they can interact with goats, pigs, and sheep. Opening times: Daily 9:30am-5:30pm. Closed Thanksgiving and Christmas Day. Admission: $23 adult, $17 children 3-11, other concessions available.